RTC's commitment to support and improve JDA®'s MMS-i™ has once again lead to another fantastic module. While using JDA's Style Performance, managers typically found that search results require additional resources. 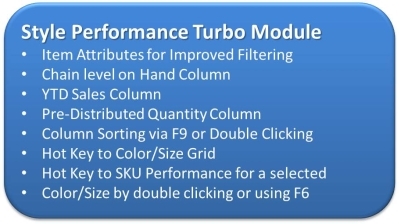 Our Style Performance Turbo Module improves the flexibility and filtering capabilities within search screens, resulting in improved workflow. This module provides additional search capability, metric visibility, and optimized usability between SKU and Style searching. By adding Style Performance Turbo Module to your JDA Style Performance application, you'll be able to peer deeper into your searches to find the exact data necessary to accomplish the task. Simply double-click the search results and drill forward and back displaying additional information such as SKU number, style's YTD sales all the way to store levels, and even that style's inventory on-hand at store levels. 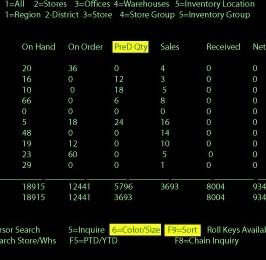 There's no longer a need to switch between Style and SKU Performance to find the data you're looking for. If you work with JDA's Style Performance, our Style Performance Turbo Module is exactly what you've been looking for.